Killer #Avocados. – The Public Diaries. Avocados are so good that you typically can’t imagine them doing anything else than melting in your mouth. However, I’ve been seeing an opposite side of them lately, which makes me feel that a war is brewing between our species and theirs. Something tells me this conflict is caused by the voracity with which people devour them. After all, we’re all guilty of taking our sandwiches, wraps, and salads with a side of avocado. I know I like my favourite – homemade guacamole – with about two of them :). My theory is that they’ve now had enough and they’ve started to fight back. Take what happened to me when I returned from holiday a month ago. I’d cut an avocado in half and was getting ready to stab the pip out of it, when the knife missed its target and went straight into my hand – under my middle finger, to be exact. I went from hero to shrieking zero in under a second and to the local hospital in less than an hour. Luckily, I didn’t need any stiches and the cut has since recovered, but I’ve been looking at avocados and knives with a quizzical brow ever since. Soon after, a colleague at work fell victim to an identical attack and five stiches were required to fix the wound. “These ninja attacks are intensifying”, I reckoned, starting to fear for the general consumer who wants to help himself to some avocado unaware of what might hit him. 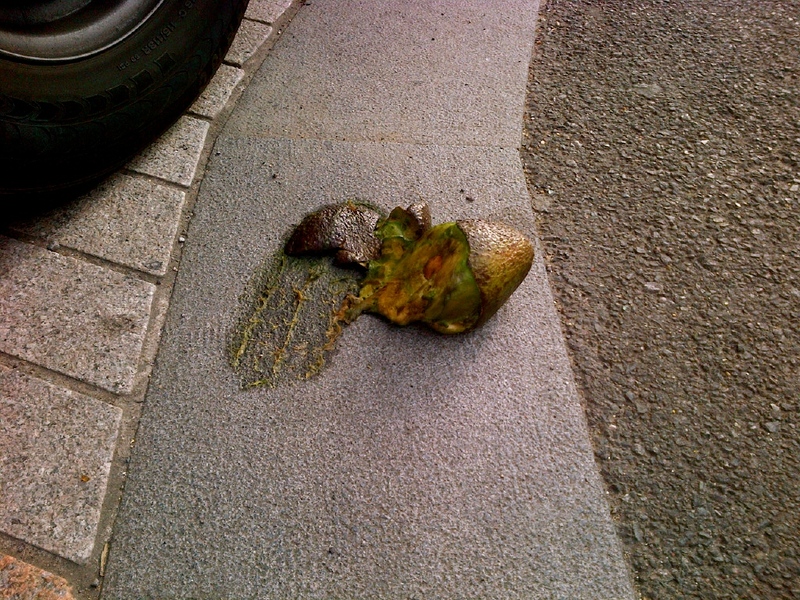 And just when I thought that the victory clearly belonged to avocados and their unexpected ambushes, I ran into a little funny surprise on my way to work that: 1) seems to confirm that there is indeed a war going on but 2) that casualties run on both sides. In this umpire’s notebook, the score currently stands at 2-1 for avocados. I therefore hope to tilt the scales in humans’ favour by slaying avocados in my kitchen on a constant basis. To that effect, I’m actually just getting ready to make some guacamole, while keeping an eye on the green monsters and kitchen knives, of course.